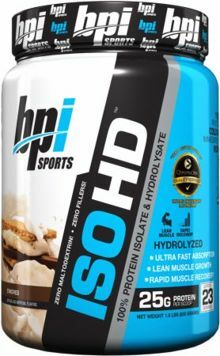 BPI Sports ISO-HD - WARNING: NOT a Pure Isolate!! Fast Absorption Whey Matrix (Whey Protein Isolate, Whey Protein Hydrolysate), Natural & Artificial Flavors, Cocoa Processed With Alkali, Hydrox Cookie Pieces (Enriched Flour (Wheat Flour, Niacin, Reduced Iron, Thiamin Mononitrate [Vitamin B1], Riboflavin [Vitamin B2], Folic Acid), Sugar, Vegetable Oil (Soybean, Palm and Palm Kernel Oil with TBHQ for freshness), Cocoa Treated with Alkali, Contains Two Percent or Less of High Fructose Corn Syrup, Degerminated Yellow Corn Flour, Chocolate, Salt, Dextrose, Baking Soda, Whey, Soy Lecithin), Cellulose Gum, Xanthan Gum, Carrageenan Gum, Silicon Dioxide, Lecithin (From Soy and/or Sunflower), Sucralose, and Acesulfame Potassium. Fast Absorption Whey Matrix (Whey Protein Isolate, Whey Protein Hydrolysate), Cocoa Processed With Alkali, Natural & Artificial Flavors, Gum Blend (Cellulose Gum, Xanthan Gum, Carrageenan), Salt, Silicon Dioxide, Soy or Sunflower Lecithin, Sucralose, and Acesulfame Potassium. Fast absorption whey matrix (whey protein isolate, whey protein hydrolysate), natural & artificial flavors, cellulose gum, xanthan gum, carrageenan, silicon dioxide, lecithin (from soy and / or sunflower), sucralose, acesulfame potassium, and FD&C Yellow No. 5. Contains: Milk And Soy. Manufactured in a facility that also processes peanuts, egg, tree nuts and wheat. Fast Absorption Whey Matrix (Milk Protein Isolate, Hydrolyzed Whey Protein Concentrate, Whey Protein Isolate), Natural and Artificial Flavors, Cocoa Processed With Alkali, Cookie Fines (Enriched Flour (Wheat Flour, Niacin, Reduced Iron, Thiamin Mononitrate [Vitamin B1], Riboflavin [Vitamin B2], Folic Acid), Sugar, Vegetable Oil (Soybean, Palm and Palm Kernel Oil with TBHQ for freshness), Cocoa Processed With Alkali, Contains Two Percent or Less of High Fructose Corn Syrup, Degerminated Yellow Corn Flour, Chocolate, Salt, Dextrose, Baking Soda, Whey, Soy Lecithin), Salt, Gum Blend (Cellulose Gum, Xanthan Gum, Carrageenan), Soy and/or Sunflower Lecithin, Sucralose, and Acesulfame Potassium. Fast Absorption Whey Matrix (Milk Protein Isolate, Hydrolyzed Whey Protein Concentrate, Whey Protein Isolate), Natural and Artificial Flavors, Cookie Fines (Enriched Flour (Wheat Flour, Niacin, Reduced Iron, Thiamin Mononitrate [Vitamin B1], Riboflavin [Vitamin B2], Folic Acid), Sugar, Vegetable Oil (Soybean, Palm and Palm Kernel Oil with TBHQ for freshness), Cocoa Treated With Alkali, Contains Two Percent or Less of High Fructose Corn Syrup, Degerminated Yellow Corn Flour, Chocolate, Salt, Dextrose, Baking Soda, Whey, Soy Lecithin), Salt, Gum Blend (Cellulose Gum, Xanthan Gum, Carrageenan), Soy and/or Sunflower Lecithin, Sucralose, and Acesulfame Potassium. Fast Absorption Whey Matrix (Milk Protein Isolate, Hydrolyzed Whey Protein Concentrate, Whey Protein Isolate), Natural and Artificial Flavors, Cocoa Processed With Alkali, Gum Blend (Cellulose Gum, Xanthan Gum, Carrageenan), Salt, Silicon Dioxide, Soy and/or Sunflower Lecithin, Sucralose, and Acesulfame Potassium. Fast Absorption Whey Matrix (Milk Protein Isolate, Hydrolyzed Whey Protein Concentrate, Whey Protein Isolate), Natural and Artificial Flavors, Cocoa Processed With Alkali, Salt, Gum Blend (Cellulose Gum, Xanthan Gum, Carrageenan), Soy and/or Sunflower Lecithin, Sucralose, and Acesulfame Potassium. Fast Absorption Whey Matrix (Milk Protein Isolate, Hydrolyzed Whey Protein Concentrate, Whey Protein Isolate), Natural and Artificial Flavors, Salt, Gum Blend (Cellulose Gum, Xanthan Gum, Carrageenan), Soy and/or Sunflower Lecithin, Sucralose, and Acesulfame Potassium. Protein Blend (Whey Protein Isolate, Whey Protein Hydrolysate), Natural & Artificial Flavors, Cocoa Processed With Alkali, Gum Blend (Cellulose Gum, Xanthan Gum, Carrageenan), Salt, Silicon Dioxide, Soy or Sunflower Lecithin, Sucralose, and Acesulfame Potassium. WARNING! THIS PRODUCT IS NO LONGER A PURE ISOLATE! PRICEPLOW DISAPPROVED! WARNING! Take a look at the newest labels for ISO-HD. You will see Hydrolyzed Whey Protein Concentrate in the protein blend!! This is not an isolate, and it has not had the carbs/lactose/milk-sugars "isolated" from it!!! Because of this, we are moving it back to the "Protein Powder" category, as it is no longer a pure isolate. Further, it is now PRICEPLOW DISAPPROVED. ISO HD contains only the finest flavoring components delivering the absolute best gourmet, mouthwatering flavors available anywhere. Unlike other brands of Isolates, that have a thin watery texture, ISO HD is thick, rich and delicious! Vanilla Cookie This is a Buy 1 Get 1 FREE offer!